PARnet is actively engaged in dialog with the following researchers and laboratories to promote new gene therapies and other forms of drug treatment for PA patients. Advances in research do not happen overnight, so ongoing support for these projects is critical for new PA treatments to be developed. PARnet is working with the Genetic Alliance, NORD, EURORDIS, NIH and other organizations who promote translational research in an effort to accelerate new treatments coming to market for patients of rare disorders. Funding Applications: Interested in Applying for Funds? Please contact research@paresearch.org or paf@pafoundation.com to receive information about applying for a grant from the Propionic Acidemia Foundation and to receive a research funding proposal form. Your initial contact should include a brief description of your project including how your studies would improve the lives of PA patients. Adeno-associated virus serotype 8 gene transfer rescues a neonatal lethal murine model of propionic acidemia. Dr. Charles Venditti, Organic Acid Research Section, Genetics and Molecular Biology Branch, National Human Genome Research Institute, National Institutes of Health, Bethesda, MD 20892, USA. Chandler RJ, Chandrasekaran S, Carrillo-Carrasco N, Senac JS, Hofherr SE, Barry MA, Venditti CP. Hum Gene Ther. 2011 Apr;22(4):477-81. Epub 2011 Feb 16. Propionic acidemia (PA) is an autosomal recessive disorder of metabolism caused by a deficiency of propionyl-coenzyme A carboxylase (PCC). Despite optimal dietary and cofactor therapy, PA patients still suffer from lethal metabolic instability and experience multisystemic complications. A murine model of PA (Pcca(-/-)) of animals that uniformly die within the first 48 hr of life was used to determine the efficacy of adeno-associated viral (AAV) gene transfer as a potential therapy for PA. An AAV serotype 8 (AAV8) vector was engineered to express the human PCCA cDNA and delivered to newborn mice via an intrahepatic injection. Greater than 64% of the Pcca(-/-) mice were rescued after AAV8-mediated gene transfer and survived until day of life 16 or beyond. Western analysis of liver extracts showed that PCC was completely absent from Pcca(-/-) mice but was restored to greater than wild-type levels after AAV gene therapy. The treated Pcca(-/-) mice also exhibited markedly reduced plasma levels of 2-methylcitrate compared with the untreated Pcca(-/-) mice, which indicates significant PCC enzymatic activity was provided by gene transfer. At the time of this report, the oldest treated Pcca(-/-) mice are over 6 months of age. In summary, AAV gene delivery of PCCA effectively rescues Pcca(-/-) mice from neonatal lethality and substantially ameliorates metabolic markers of the disease. These experiments demonstrate a gene transfer approach using AAV8 that might be used as a treatment for PA, a devastating and often lethal disorder desperately in need of new therapeutic options. Hua Jiang K., Sudhindra Rao, Vivien C. Yee, and Jan P. Kraus. Characterization of Four Variant Forms of Human Propionyl-CoA Carboxylase Expressed in Escherichia coli. (2005) J. Biol. Chem., Vol. 280, No. 30, 27719-27727. Efforts are underway in the Kraus lab to understand how the enzyme PCC is assembled in vivo and to find options for correcting PA mutations that are defective in PCC assembly. Barry MA, Campos SK, Ghosh D, Adams KE, Mok H, Mercier GT, Parrott MB. Biotinylated gene therapy vectors (2003)Expert Opin. Biol. Ther. Sep.3(6):925-40. Dr. Barry's lab is currently constructing and testing biotinylated adenoviral vectors for liver-specific targeting of PCCA. Sonia Clavero, Belen Perez, Ana Rincon, Magdalene Ugarte, Lourdes Desviat. Qualitative and Quantitative Analysis of the Effect of Splicing Mutations in Propionic Acidemia Underlying Non-Severe Phenotypes. (2004) Hum. Genet. 115: 239-247. The Ugarte lab has a long history of PA mutation identification and DNA analysis. Patients with splicing mutations in PCCA or PCCB have the potential of being treated if drugs can be developed to correct certain cellular splicing defects. Toru Miyazaki, Toshihiro Ohura, Makio Kobayashi, Yosuke Shigematsu, Seiji Yamaguchi, Yoichi Suzuki, Ikue Hata, Yoko Aoki, Xue Yang, Christina Minjares, Ikuko Haruta, Hirofumi Uto, Yuriko Ito, and Urs Mueller. Fatal Propionic Acidemia in Mice Lacking Propionyl-CoA Carboxylase and Its Rescue by Postnatal, Liver-specific Supplementation via a Transgene (2001) J. Biol. Chem., Vol. 276, Issue 38, 35995-35999. Ongoing studies in Dr. Miyazaki's lab are underway to find a method of using liver stem cells for PCCA delivery. A personal account of the events leading to the identification of Propionic Acidemia. 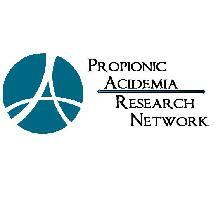 © 2012 Propionic Acidemia Research Network. All rights reserved.